Cats are the true secret owners of the human race. They just allow us to think they're our pets. In reality, we are their pets. I've lived with cats all my life except the past few years. 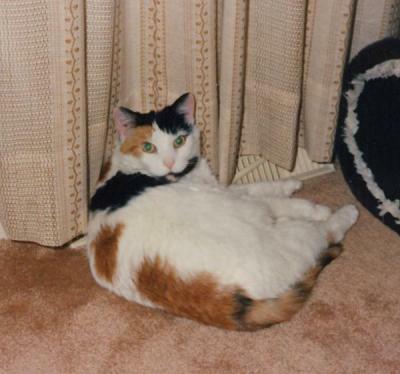 My last cat, Cheryl II (pictured above) was a piebald tortie (calico) with a voice that could give any Siamese cat a run for the money and a very loud purr. Cheryl II died early in the morning of September 28, 1996 from complications after the extraction of her left eye which had become infected with a malignant melanoma. My allergies have improved considerably since I've been without a cat. Luckily my sisters all have cats so I get some pets in from time to time. You can also view pictures of some of my other previous cats and more photos of Cheryl II. As of October 2001 I've retired my previous cat links pages.